It is difficult to really visualize global warming, but a new animation vividly illustrates how much global temperatures have risen since 1850. Constructed using data from the UK’s Met Office , the animation shows global warming rapidly gathering pace in recent years. Ed Hawkins, a climate scientist at the University of Reading, developed the unique animation to show the average monthly temperatures as a spiral shape, getting larger as the world has got warmer. What is 2016 looking like so far? Both 2015 and the first six months of 2016 are shown to be significantly warmer than the proceeding years. If you look at the data used in the spiral animation and in the graph below from NASA, it is clear how much 2016 stands out. Last month was the hottest June ever recorded globally, and the 14th consecutive month of record-breaking heat, according to data from NASA and the National Oceanic and Atmospheric Administration (NOAA). June 2016 was 0.9C hotter than the average for the 20th century, and the hottest June since records began. 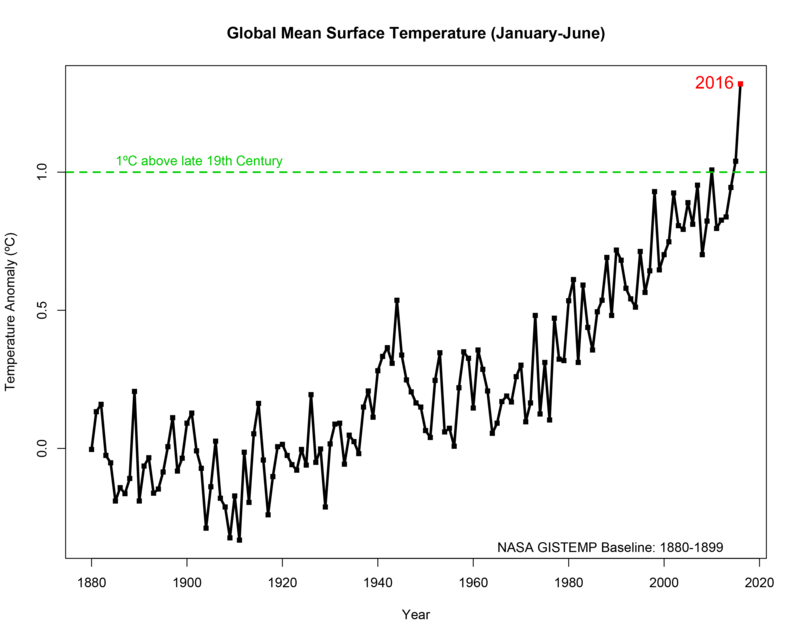 NASA’s figures compare each month going back to 1880 against average temperatures between 1951 and 1980. What's happening to sea ice? Sea ice has been shrinking faster than normal with five out of the first six months of 2016 seeing the smallest respective monthly Arctic sea ice extent since satellite records started in 1979. The extent of Arctic sea ice at the peak of the summer melt season now typically covers 40 percent less area than it did in the late 1970s and early 1980s. "It has been a record year so far for global temperatures, but the record high temperatures in the Arctic over the past six months have been even more extreme," Walt Meier, a NASA Goddard sea ice scientist, said in a statement . "This warmth as well as unusual weather patterns have led to the record low sea ice extents so far this year." While El Niño has been a significant factor in recent temperature increases, it is by no means the whole story . Most of the current warming, compared to pre-Industrial Revolution levels, is the direct result of greenhouse gas emissions. With temperatures this year at times getting so close to 1.5 degrees Celsius above pre-industrial levels, the key threshold of 2 degrees no longer seems remote or intangible. Why is 2 degrees so significant? The 2 degrees Celsius mark is held as a significant point for life on earth, and has traditionally featured strongly in climate discussions. Climate researchers believe that an increase in global average temperatures of 2 degrees Celsius above pre-industrial levels would take the world into unchartered territory, with potentially unforeseen consequences in terms of extreme weather and climate feedbacks that could accelerate the melting of polar ice and sea-level rise. The Paris Agreement , drafted last December, aims to limit warming to less than 2 degrees above pre-industrial levels, with a more ambitious target of 1.5 degrees. As the animation shows, that temperature is very close to being reached for the first time. Have you read? The Paris climate agreement – what happens now? February was the hottest month on record. Are we losing the fight against climate change?